Top quality Alloy Steel Load Cells are mounted on the fork. Low profile design for moving into and out of the pallets smoothly. 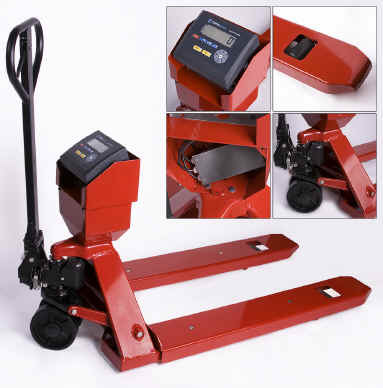 Three planks on the middle underside of a pallet can cause binding of the jack mechanism, resulting in an inaccurately high weight readout when the forks are raised (the pallet jack wheels do not usually bind). Single plank on the middle underside of a pallet does not cause binding of the jack mechanism. *Minimum lowered height is 3.3"